I have cooked with many grains before. I am a huge fan of quinoa, barley, and couscous. However, I have never cooked with farro until now. I bought a huge bag of farro at Costco, my new favorite place to shop. I mean they have LaCrema for $13 a bottle- enough said. Most health food stores like Earthfare and Whole Foods carry farro too. 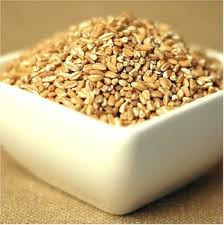 If you are not familiar with farro, it is a tiny grain that looks kind of like a seed. This recipe is what Giada calls her Italian version of Mac and Cheese. It is delicious. This is cheesy baked goodness filled with three different cheeses, tomatoes, mushrooms and breadcrumbs. I like to think this is healthier than mac and cheese because it is made with a grain, but who am I kidding? Either way this dish is tasty. In retrospect I probably should have made my first recipe post of the year a healthy one since most people are probably dieting. Oh well, bookmark this and make it in two weeks. You know you'll be done with the whole diet thing and back on the food train by then. Preheat the oven to 400 degrees F. Spray a 13 by 9-inch baking dish with cooking spray. For the sauce: In a 2-quart saucepan, melt the butter over medium heat. Add the flour and whisk until smooth. Gradually add the warm milk, whisking constantly to prevent lumps. Simmer over medium heat, whisking constantly, until the sauce is thick and smooth, about 8 minutes (do not allow the mixture to boil). Remove from the heat and season with salt and pepper, to taste. For the farro: In a large bowl, add the cheeses and stir to combine. Remove 1/2 cup of the mixture and reserve. In a large stock pot, add the chicken broth and bring to a boil over medium-high heat. Add the farro, reduce heat and simmer, stirring occasionally, until the faro is tender, about 25 minutes. Drain, if necessary. Add the farro, thyme, and sauce to the bowl with the cheese. Stir until combined and season with salt and pepper, to taste. Pour the mixture into the prepared baking dish and top with the reserved 1/2 cup of cheese. Sprinkle the top with bread crumbs and drizzle with olive oil. Bake until the top is golden brown and forms a crust, about 25 to 30 minutes. Remove from oven and let stand for 5 minutes before serving. Mmmmm. Looks good. Does your son eat this too? This sounds delish...I will be making asap! Thanks.